Explosive detection dogs are on an unbelievably important mission. Find out how they are trained and which breeds are top candidates for jobs like this. 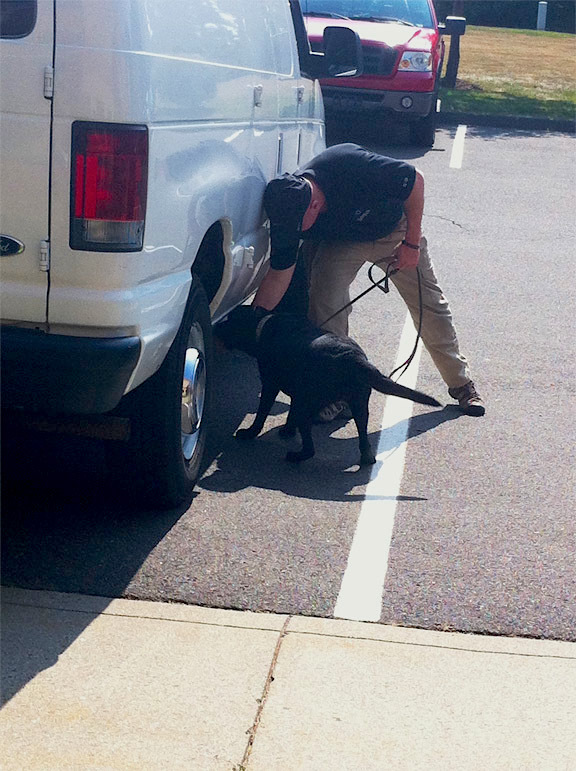 Joe Martel and Explosive Detection Canine (EDC) Lucia practice a vehicle search. Photos by Jillian Blume. Trainer Joe Martel attaches a magnetic box containing an explosive odor to the bottom of a van and encourages Lucia, a black Labrador Retriever, to take a sniff. As soon as she does, she is rewarded with a treat. Each time, he places the box farther in and encourages the dog to go deeper underneath. Her tail never stops wagging, and her eyes sparkle with excitement. She is having the time of her life with no any idea that one day, she could save lives. Lucia is among the crop of new “green” dogs who have come to MSA Security’s new 26,000-square-foot, state-of-the-art EDC (Explosive Detection Canine) Training Facility in Windsor, Connecticut. Martel, a retired Connecticut State Police officer, bomb technician and EDC handler, prepares handlers to get government validation and is responsible for the imprintation (the process of training a dog to recognize and remember explosive odors) of rookie canines. MSA acquires its dogs from different foundations, says Michael Wynn, director of canine training and EDC team certification at MSA and former Connecticut State Police trooper and canine handler. One source is Puppies Behind Bars, where chosen inmates are assigned 8-week-old puppies to raise and train until they’re ready to start additional training as service and bomb dogs at around 2 years old. MSA also gets dogs looking to make a career change after flunking out of Guiding Eyes for the Blind’s guide dog school in Yorktown Heights, NY — those squirrel-chasing, want-to-party dogs with way too much energy and curiosity for guide work are often a perfect fit for explosive detection work. When it comes to nose work, dogs rule. Why? Because dogs have 200 million nasal olfactory receptors — humans have only 5 million. One-third of a dog’s brain is devoted to smell. The area dedicated to identifying different scents is 40 times larger than the same area of the human brain. 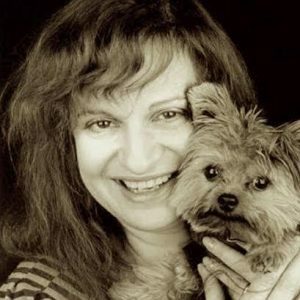 So when a dog sniffs your perfume, he can smell the individual scents of aldehydes, bergamot, lemon, neroli, ylang-ylang, jasmine, rose, lily of the valley, iris, vetiver, sandalwood, vanilla, amber and patchouli that constitute the fragrance. Humans just smell Chanel No. 5. Explosive odor is broken down into 5 basic explosive groups called families. By imprinting the main explosive ingredient in each family on the dogs, it allows them to recognize a vast variety of commercial, military and improvised explosive devices. At MSA Security, future bomb dogs are introduced to the 5 families of explosive odor through perforated “scent cans” containing samples of uncontaminated chemicals lined up in rows and implanted in luggage and shipping boxes. The dogs are first trained to find “low explosives,” says Wynn, which include gunpowders such as black powder, smokeless powder and pyredex. Once the dogs learn that odor, they move on to the next family, high explosives, which have TNT as their main ingredient. “As long as you imprint the dog on uncontaminated TNT, the dog can then branch out into many different combinations of commercial and military explosives that contain it,” says Wynn. Other main ingredients that the dogs imprint are RDX and PETN. Most law enforcement and military agencies use a play/reward system in the imprintation process. The dog smells a small amount of explosive odor and is then rewarded with some kind of toy. “That’s called operant conditioning,” Wynn says. The other methodology is traditional food reward. The dogs learn to sit as an alert and stay at the source when they detect an explosive odor. MSA prefers working with Labrador Retrievers. Was YOUR Pet Food Recalled? And if Labs are food stupid, German Shepherds are play stupid — as Soleil, a black GSD obsessed with her ball, demonstrated. These dogs are imprinted by using a favorite toy as the reward. The dogs are imprinted on a course designed by the MSA team. “It takes 6 to 8 weeks for the dogs to learn how to do complete searches of vehicles, luggage, boxes, cargo and room searches,” says Wynn. They learn where to find the scent through the scent cans embedded at the corners of cartons, the seams in luggage, the wheel wells and undercarriage of parked vehicles. During this time, the dogs stay at Day Hill Kennel, a state-of-the-art facility across the road. After the dogs are imprinted, the former law enforcement and military handlers hired by MSA arrive at the center to work with the dogs. German Shepherd Soleil, an EDC dog who loves toys, waits on handler Mike Belanger’s command. The handlers begin working with their dogs, and within 2 or 3 days they find the match that works best for the dog and for the handler. 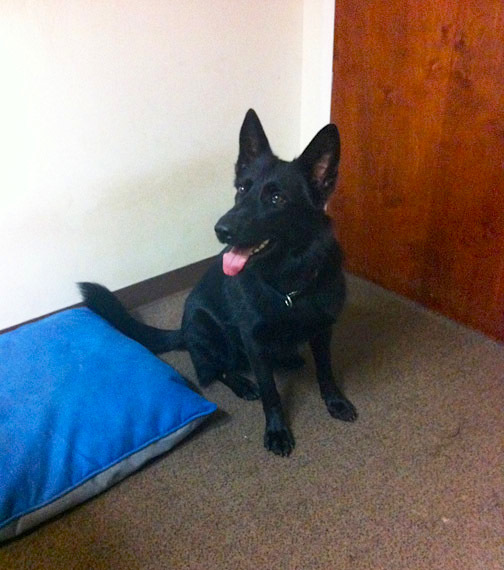 During the 3-week training period, the dogs stay with their handlers at their hotel rooms. Once handler and dog go home, they go through orientation at the work locations until the dogs are accustomed to the environment. From that point forward, the dog stays with that handler. They generally work 8 to 10 hours a day, 2 or 3 days a week. “When the dog isn’t working, we want him in the family home, relaxing and being a pet, leading a normal dog’s life,” says Wynn. They also take into consideration the company vet’s assessment. Dogs are retired when they reach 9 years old. Editor’s Note: This article is part of an occasional series about various professional working dogs in the United States. Previously, we spotlighted guide dogs for the vision-impaired.